Whether you grow your own tasty red potatoes or choose them carefully from the produce section, these tender gems are an ideal way to complement many main dishes. With their red, thin skins and stark, white flesh, red potatoes look distinctively different from other potato varieties. 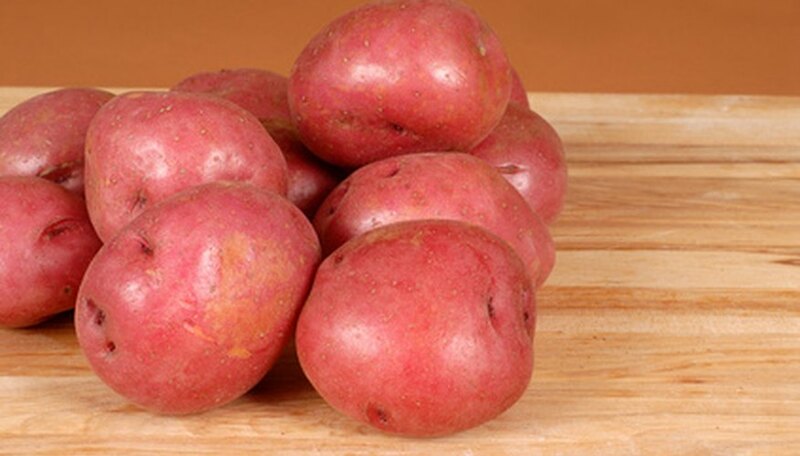 Red potatoes steam and roast easily, in either the oven or the microwave oven. Streamline your meal preparation and microwave small red potatoes as a delicious and nutritious addition to any meal. Place the red potatoes in the colander, and rinse them with cool water. Scrub each potato vigorously with the vegetable brush to remove surface dirt. Examine each potato for blemishes and bruising. If you find bad spots, cut them out with the paring knife. Insert the tines of the fork through the skin of each potato at two or three different points. This will allow steam to escape through the holes during the microwaving process, preventing the potatoes from exploding. Place the potatoes into the shallow dish, arranging them around the outer perimeter. Situate the potatoes in a single layer at least 1 inch apart, if possible. Place the dish into the microwave, and cook the potatoes on high for five minutes. Turn the dish one-half turn and microwave the potatoes on high for five more minutes. Check the potatoes to see if they are finished cooking by inserting the tines of the fork into the largest potato. If the tines slide in easily, the potatoes are finished cooking. If the potato remains hard, rotate the dish one-half turn again, and cook them for two more minutes. Remove the dish from the microwave, and cover it. Allow the potatoes to stand covered on the counter for five minutes, and then serve them. The potatoes will continue to cook during the standing time. Remove them from the microwave while slightly firm, and they will finish cooking while they stand.